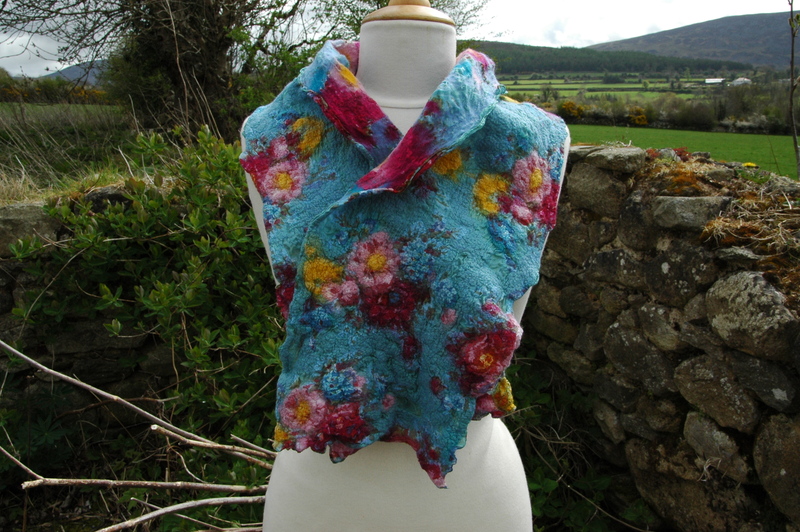 April showers bring forth May flowers, sweet pea nuno felt poncho/wrap/cropped top! Well, it is lashing outside this morning and for those of you not familiar with Irish expressions lashing means very heavy rain! I had been planning on photographing some nuno felt scarves and wraps before uploading them to my new boutique but obviously I need to wait until we get a bit of a break in the weather. The good news is that I had a guilt free morning finishing fulling a large piece of nuno felt, I laid it out yesterday afternoon and had got it to the rolling and fulling stage before having to call it a day. I love creating pieces that can be worn in more ways than one and this piece definitely fits the bill. Basically it is a large reversible square with a hole in the middle and worn with corners pointing down it is a poncho, corners to the side a cropped top and if you fold it in half along the diagonal and roll the long edge slightly it makes a great warm wrap perfect to throw over your shoulders when the evenings get cool. I don’t know how I suddenly ‘re-discovered’ the lilac muslin yesterday that I used for the base but with a house as tidy as mine every day in an adventure ploughing through piles of ‘stuff’! Anyway, the lilac is wonderful with some of the beautiful sweet pea shades of light pink, blueberry and raspberry coloured kap merino from Wollknoll. I also had some stunning hand dyed silk lap left over from a project earlier in the year and this just gives nice extra colour and texture to the surface of the wool side. As the project progressed I was having huge debates with myself as to how or where I was going to cut into the square to create either an opening for the head or alternatively two arm holes which had also been in my mind. What I decided to do was wait until the nuno felt was almost finished shrinking and then pin or drape the felt over my manequin before making the decision. This worked well because immediately the poncho style looked good, now I want to make another large piece of flat felt but round this time. This one I will cut with two armholes and create a circular shawl loosely basing the design on this adaptation of Barbara Pooles. I think judging from my draping and folding this morning the circle will drape better for a sleeveles top than the square. If you haven’t already enjoyed this short video take a look now and I promise to upload pictures of my ‘Sweet Pea’ poncho/wrap/cropped top just as soon as the rain stops and I can take them! Special offers and the power of Twitter as my new boutique felt store goes live! Exciting news, at least for me! 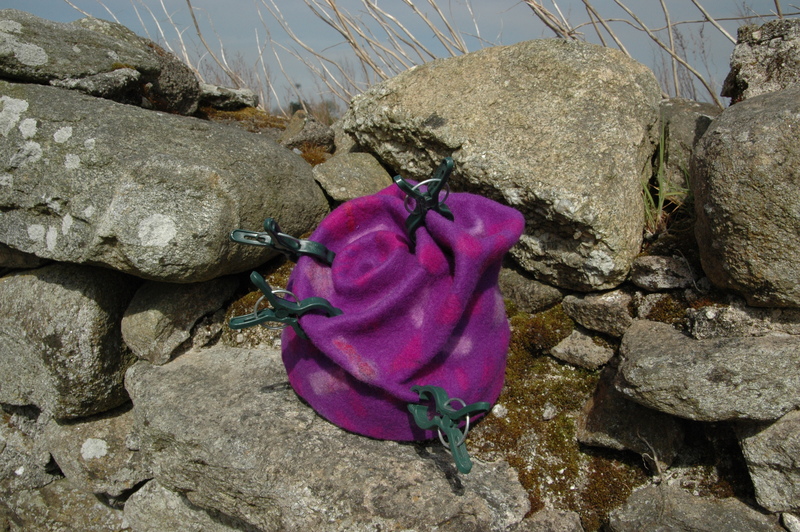 Although it is going to take a couple of weeks hard work felting new summer stock, photographing work already completed and uploading everything to my new exclusive boutique online store CLASHEEN, as of last night the store is live and I have already made my first sale!!! After a lot of soul searching and research, I decided like my good fibre friend Chrissie Day that Etsy is not really the market place for my one off designs. Big Cartel offers a much more boutique shopping experience and if I were quite honest customers who appreciate hand felted designs are the demograph that I am aiming to attract. To this end, all my felt wearbales and new interior/exterior design range will be exclusive to the new store although I will still be offering a limited selection of supplies from the middle of May on Etsy. These will include an interesting nuno felt scarf kit complete with silk/cotton fabric, merino, silk fibres and an instruction video! For the next week only I have a selection of experimental felt accessories avaiblable at a discount of 40% off their original price as a stock clearing excercise so if you want to snap up a bargain head over to Etsy now, these items are sold as seen and anything left after Friday 7th May will be de-listed and not offered for sale again. I also have two nuno felt scarves/wraps on special offer at my new store and look forward to having regular specials and seasonal items as we progress through the year. It is going to take a little getting used to but the system as operated by Big Cartel appears to use a simpler way of uploading items than Etsy (not complaining about Etsy, it served its purpose for me). I discovered this afternoon that once an item sells it is still visable to the public although it does say sold out if you click through to the description. This is something I need to keep an eye on but once I get the hang of things I think that it will be a lot quicker and easier to maintain the store as well as having a much more luxurious and individual look about it although I’ll let you all be the judge of that! Lastly the power of the internet is a wonderful thing. When the boutique store finally went live late yesterday afternoon I posted a quick tweet for all of you following me on Twitter, congratulations to Olwyn who is now the proud owner of this gorgeous felt vessel! Stunning printed silk for nuno felting, new online store about to go live! At the moment it just seems to be a roller coaster ride, organising my American workshops (sorry about the lack of details yet, trying to pin everything down in reverse order time wise! ), sorting out my new online store, ploughing through the ever mounting paperwork and housework (on the back boiler yet again!! ), attending to my golf club duties (unpaid I might add) and trying to get some time to actually felt and be creative. 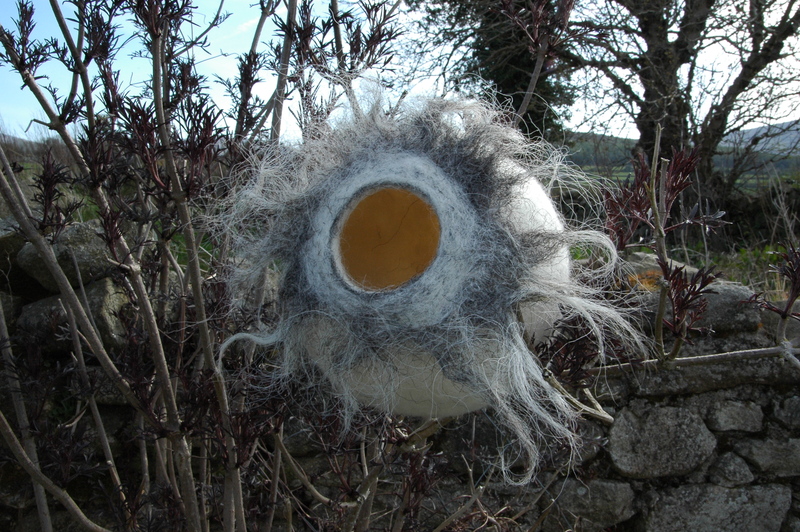 Spending time felting is the one thing that keeps me sane and although Alan can’t understand why I feel compelled to get into the studio when so many other things need to be done I just would go totally mad if I didn’t get a little time to play around with fibres! On Saturday morning I drove into Carlow town with Alan as we had a washing machine of his in the back of my truck which needed some repairs, my truck is very handy for hauling stuff around! Anyway, while I was on this mission of mercy I managed to call into a nearby shop for a couple of minutes to check out their t-shirts and have a look at some of the latest summer accessories. I was lucky enough to have the very good fortune of snapping up three stunning printed silk scarves, absolutely perfect for the pictured nuno felt wrap! I laid out short fibred merino and silk fibres on one side of the silk scarf roughly following the colours in the print though not being totally confined by colour at the same time!! It did take me longer than usual to lay out the fibres but I definitely think that the results have been worth the effort, I love the finished colours and texture! During the course of this week I promise to launch my new online store and this wrap/scarf will be one of the special items I am offering to launch my summer collection!!! Here is a close up shot to show how I followed the colours and shapes printed on the silk when laying out my fibre. My new felt hat and a couple of book recommendations if you are interested in hats! Inspired by fellow Feltmakers Ireland member Sharon Wells, I decided to have another go at making myself a soft but structured felt hat that actually fits my very small head. Sharon posted about making the origami hat from Christine White’s book Uniquely Felt on Feltcreative and since this project has always been on my ‘to do’ list and I had a pile of prefelt waiting to be used I decided the time had come to just give it a go! In addition to Uniquely Felt the books that I would recommend for anyone wanting a bit more info about felting hats are ‘Fabulous Felt Hats’ by Chad Alice Hagen, ‘Filtning, Nunofilt & Nalefiltflor’ by Grete Lottrup and ‘Felting Fashion’ by Lizzie Houghton. While Chad Alice’s book is the only one totally dedicated to hats all of them to my mind have helped me work out the various steps necessary to create stylish headgear that actually fits and is wearable. 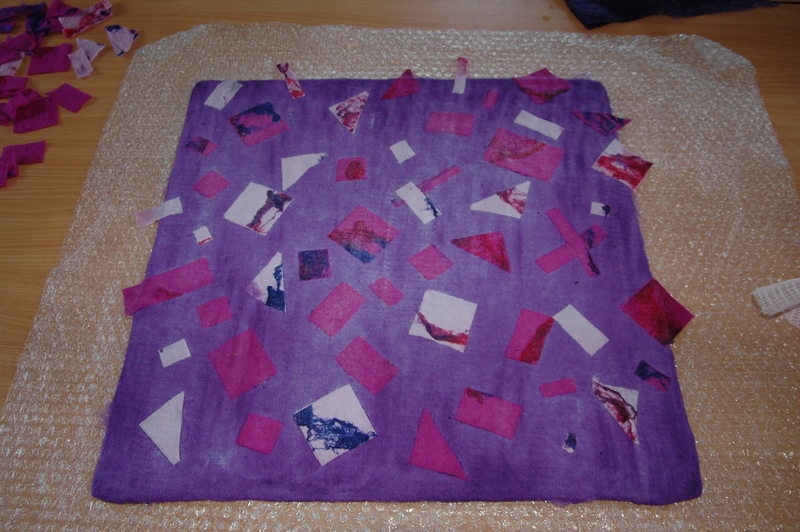 Like Sharon I decided to work with a square resist 47cm wide. One of my friends actually has my copy of Uniquely Felt so I just had to estimate how much wool I would need for each side, excluding the prefelt I used a total of 84g short fibred merino for the hat but have no idea if that is a lot or a little! I laid out the wool extremely finely on both sides of the resist and then laid my prefelt shapes randomly on top making sure to overlap the edges in some places. Because I originally intended having a brim that would turn back to reveal hand dyed silk fibres from the bottom of the other side, I chose not to position any prefelt overlapping the fourth edge as I was afraid I would forget exactly where the silk was once I started working the felt! Due to my golf club commitments over the last few days (and I STILL have another golfing engagment tomorrow) I had to felt the hat over several different sessions and this afternoon I was able to finish fulling and shaping it over one of my cooking bowls. Unfortunately, although I do have a hat block it is just too huge for my own head but the bowl worked perfectly so nothing ventured nothing gained. It did take a long time to shrink this hat enough to fit my head so the next one that I make (and there will be another one!) will have a wedge shaped template, not a square. The other outcome with fulling as much as I did is that the clarity of the prefelt gets muted and the silk almost disappears into the wool, not a problem but definitely something to consider. In the end I decided that I liked the brim folded inside of the hat instead of outside as initially intended, it would of course be possible to wear it both ways anyway! If you are interested in seeing any more views of the hat in progress I have uploaded them to Flickr and as soon as the hat is dry I might ask Alan to take a picture of me wearing it! Tomorrow is another day and I hope to crystalise plans for my American workshops and spend some time answering emails and generally catching up with things. In honour of Earth Day ….. Check out Ecosia today, a really cool green friendly search engine as blogged about by Cathy on her art and ecology notebook! Why not join me and run a search for yourselves to see how many new feltmaking websites and blogs we can find? I love the idea of saving a little piece of rainforest every time a new search is instigated! Thanks for all your responses to date regarding etamine, I am dying to get started with a project as soon as my golfing duties are over this evening. Under pressure for time over the next couple of days as golf duties prevail! 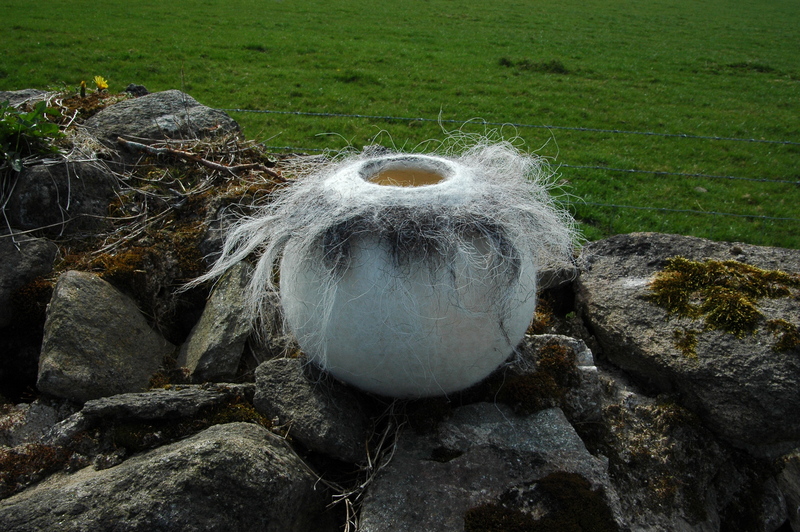 I just thought that while you were pondering on the etamine question you might like to see a couple of pictures of the vessel I felted combining C1 and Herdwick fibre. Has anyone ever felted with etamine??? Feedback please! Last summer at the Felt in Focus symposium in Denmark Lyda Rump had some wonderful hand dyed fabric the like of which I had never seen before and which she explained to us was called etamine, it was 100% wool. I do remember that Lyda said it was particularily suited to shibori (in a washing machine??) and also for using discharge paste to remove selected areas of colour, have any of you had a go??? Trying to do a bit of research on the internet did disclose that wool etamine is good for nuno felting but the info is sketchy and I am looking for some feedback. Wollknoll are now selling etamine scarves and fabric by the metre and my latest order has just arrived this morning complete with 4 of the scarves, unfortunately the colour I wanted from a bolt must have been out of stock so I don’t have any small samples to practice on as I had expected. 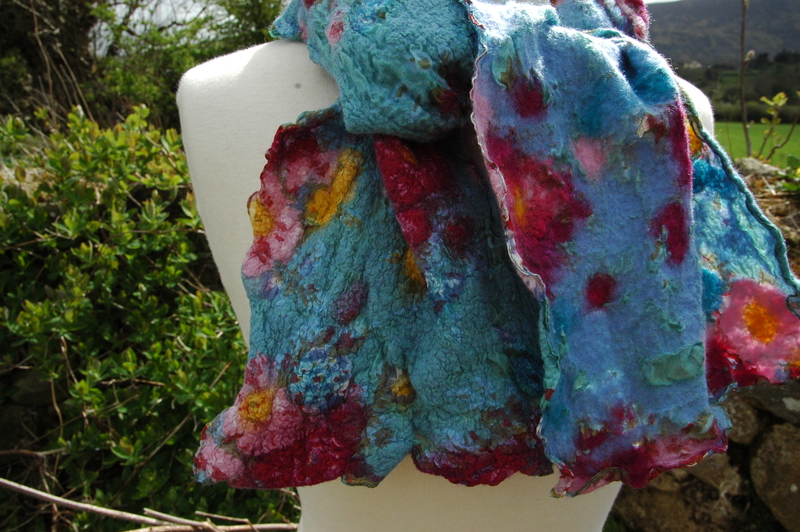 At E12.50 plus P&P the scarves are not a cheap raw material so if any of you have some advice about the possible shrinkage rate, results you have had, pictures of work you have created etc. and are happy to share here that would be great thanks! As an aside, if you are interested in having a peak at the video I created for Kelly recently for the Going Green Swap with a Twist on Ravelry head on over here to Clasheen Uncut!